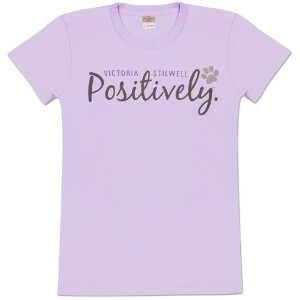 Show your passion for changing dogs' lives Positively by wearing this stylish ladies' T-shirt in Orchid designed by Victoria. Featuring a stylish ladies' fit with shorter body length and tapered sleeves, this 100% cotton T-shirt will not shrink and is double-needle stitched for added flexibility. These shirts run smaller then unisex T-shirts, so if you are between sizes, we recommend choosing the larger size. Only available in Orchid (lavender). Perfect fit and super cute t-shirt.